This duplex, built in 1911 by the contractor Joseph Bourque, combines elements of the Beaux-Arts and Italian styles. When Arthur Bourque, Joseph's son, inherited it in 1918 it, he was already occupying the entire building. Ten years later, Bourque went bankrupt and his sister Alexina repurchased the house from the receivers. She sold it to Lucien Massé, a prominent accountant, who rented it to two tenants. On August 5, 1942, Marie-Berthe Laflamme, wife of Alexandre Taché, bought the house and transferred ownership to her husband on December 14. The Tachés did not move in right away, because the building was occupied by two tenants, Ludovic Blain, a notary, and Albert Couture, a jeweller. In 1944, the Taché family moved into 174 Champlain while Blain remained in 172 until 1947. When he left, the family moved into 172, leaving their previous flat to a nephew, Herbert Huard, a civil servant. Needing more space, Taché had a door installed between the front bedrooms of the two units, and for several years, closed off the main entrance to 172. Mrs. Taché left the house around 1964. Her tenant, Mrs Flora A. Vaney, bought it on October 30, 1967. 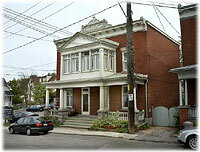 The man who left his mark on the history of this house was born in Saint-Hyacinthe, on August 17, 1899. Alexandre Taché was the son of Joseph de La Broquerie Taché (1858-1932), a notary and journalist, who moved to Ottawa in 1914 to work as King's Printer and Parliamentary Librarian. Among his great-uncles and uncles were Étienne-Paschal Taché (1795-1865), Prime Minister of Lower Canada and Father of Confederation, and Mgr. Alexandre Taché, Archbishop of Saint-Boniface, Manitoba, from 1851 to 1894. His mother, Marie-Louise Langevin (1864-1936), was related to Hector-Louis Langevin, another Father of Confederation. On October 26, 1925, in the Notre-Dame-de-Grâce Church in Hull, Alexandre Taché of Ottawa married Marie-Berthe Laflamme, the minor daughter of Édouard-Hector Laflamme, insurance agent, and Delvina Berthiaume of Hull. The marriage contract stipulates that "the wife-to-be shall have full control over her real and personal property [...] She may, by her sole signature, without the need for her husband's consent, acquit any debts due her or make any conveyance..." Until recently, it was extremely rare for a woman in Quebec to conclude a deal without the signature of her husband. The financial autonomy enjoyed by Mrs. Taché was most unusual for a woman at that time. Five of the couple's seven children would survive their parents: Alexandre, Yolande, Pierre, Suzanne and Lyse. Taché studied at the Seminaire de Saint-Hyacinthe, the University of Ottawa and the University of Montreal. He became a lawyer on January 21, 1924, and a King's Counsel in 1938. He was president of the Hull District Bar from 1939 to 1944. The University of Ottawa awarded him a doctorate honoris causa in 1946. Taché's political career began in 1936 when he was elected the representative from Hull to the Legislative Assembly, under the banner of the Union Nationale party. Defeated in 1939, he was re-elected in 1944 and continued to represent the district until 1955. He had the longest term as Speaker of the National Assembly: from February 7, 1945 until December 15, 1955. As a representative, Taché was particularly interested in the reconstruction and the development of regional institutions: schools, the Hull prison, the hospital and the Saint-Thérèse orphanage. He supported Hull's theatre companies, literary associations, and local artists, some of whom became prominent: the painter Jean Dallaire, the actor Guy Provost and the pianist Léon Bernier. On the eve of the elections of 1944, 1948 and 1952, Quebec Premier Maurice Duplessis was Taché's guest in Hull. Duplessis would arrive with his doctor and take over the entire top floor. In 1956, at the end of his political career, Taché was appointed a judge of the Magistrate's Court in Hull, and then promoted in 1958 to the Superior Court for the districts of Hull, Labelle and Pontiac. He died in Hull on March 9, 1961, at the age of 61. Taché was greatly admired by his circle of acquaintances and recognized for his loyalty, his tenacity, his perspicacity, his tolerance and his savoir-faire. One of them recalled that, "[in] labour disputes... he was always on the side of the worker, whether as an arbitrator or a lawyer". His elder son, Alexandre, entered the Oblates of Mary Immaculate, and became their solicitor in Rome. Pierre, born on November 22, 1928, became a lawyer in 1954 and a Quebec Court judge on September 6, 1988. He was a man who combined humour and principles. He died on January 25, 1996, at the age of 67.